The PA Turnpike Mainline is approximately 359 miles long. The PA Turnpike has an extension, called the Northeast Extension, which runs from the PA Turnipke Mainline, just east of the Germantown Pike exit, Exit 333, north to Allentown, Wilkes Barre, Scranton and ending adjacent to I-81. The exit for the Northeast Extension is, itself, not numbered. The Extension has its own mileage numbering system, and it is labeled as \"NE Ext\" in the toll calculator's drop-down menus. ► Starting exit and Mile Marker: Westgate / Ohio Turnpike at Mile Marker 1.4, in Enon Valley. ► Ending exit and Mile Marker: 131:NE Ext / I–81 / US 11 / Clarks Summit at Mile Marker 131.3, in Clarks Summit. Pennsylvania is in the process of converting its tolling to a new vehicle classification structure, and eventually the weight class will be eliminated. The conversion process began on April 29, 2018 at the Clark's Summit Toll Plaza and the Keyser Avenue Toll Plaza, both located at the north end of the Northeast Extension of the Pennsylvania Turnpike. Starting with these barriers, a new axle and height-based system is being tested and implemented. 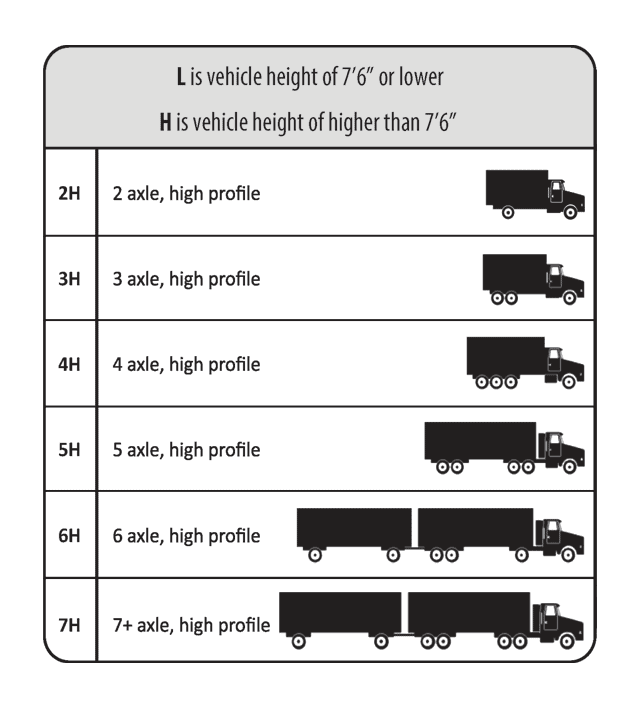 This new axle and height system is similar to New York, using the same class identifiers as the NYS Thruway. See the insets for reference. Cash will no longer be accepted at the Keyser Avenue and Clark's Summit Barriers, as Pennsylvania is moving to an open-road tolling system. If you use these barriers and do not have an E-ZPass or compatible toll pass, you will receive an invoice for your tolls. ► Class 1: Passenger cars, motorcycles, vans, etc. ► Class 2: 7001 to 15,000 lbs. ► Class 3: 15,001 to 19,000 lbs. ► Class 4: 19,001 to 30,000 lbs. ► Class 5: 30,001 to 45,000 lbs. ► Class 6: 45,001 to 62,000 lbs. ► Class 7: 62,001 to 80,000 lbs. ► Class 8: 80,001 to 100,000 lbs. 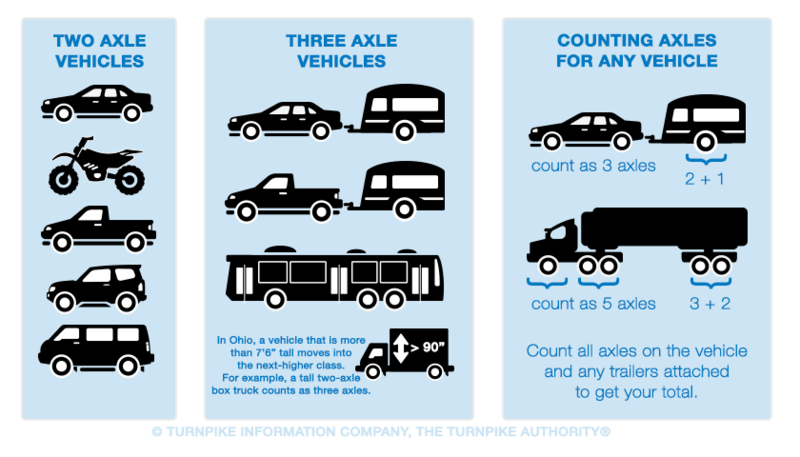 Additionally, tolls on the Pennsylvania Turnpike are calculated based on the number of axles for your vehicle. When counting axles, make certain to count the axles with wheels on the ground, including any axles on trailers you may be towing. 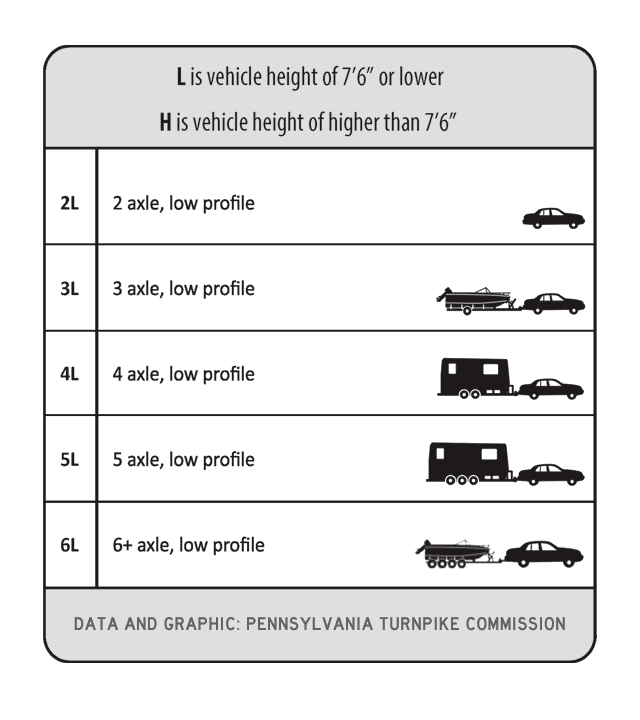 There are 7 axle designations for Pennsylvania.